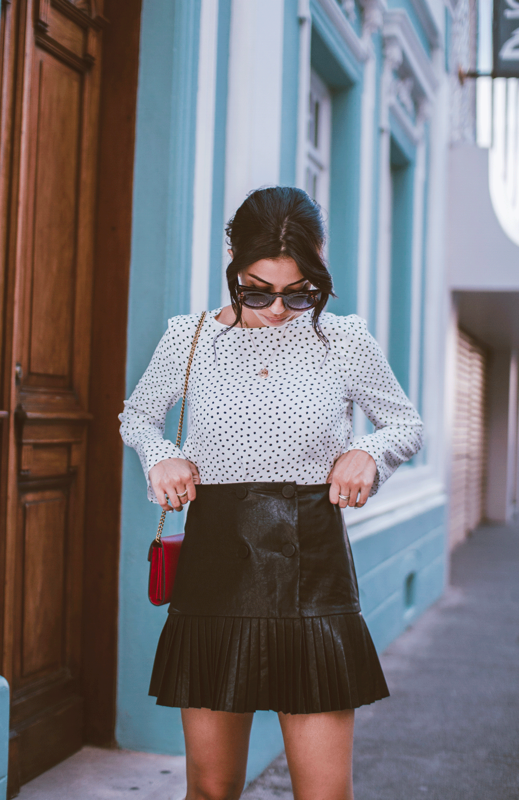 The polka dot long sleeve is such a universal piece. Like, we’re talking formal, casual, dressed up, dressed down. Forever21 is where this beauty is from. The sleek part, though, is this black leather skirt! It is all of the fashion favorites in one- high wasit, button accents down the front, and pleated at the bottom. This one is from Zara. Of course, since the skirt and polka dots on the shirt are black, it is only right to have fun and add pops of color to the outfit. Red was my choice, but you could easily do mustard yellow, royal blue, or whatever your heart is feeling that day. I chose a red Gucci bag and red Zara shoes. There you have it folks, Sleek in the City.